A rich and flavorful blend of four Bourbons from a legendary family. What would happen if the descendants of the legendary Beam family got the itch to reenter the distilling business? This is what would happen… meet Limestone Branch Distillery. Steve and Paul Beam launched their fledgling distillery and released their first super-premium spirits in 2015. The initial results were so promising, that industry giant Luxco bought a 50% stake to provide distribution and expansion capital. So far their line-up contains three gold-medal-winning Whiskies and they are just getting started. The first Yellowstone brand Whiskey was created by Taylor & Williams in the late 1800s. The brand changed hands many times over the years, but most recently arrived at Luxco — who has partnered with Limestone Branch to revitalize the brand. And it makes sense because Steve and Paul’s great-granduncle was the original distiller for the brand back in the day. 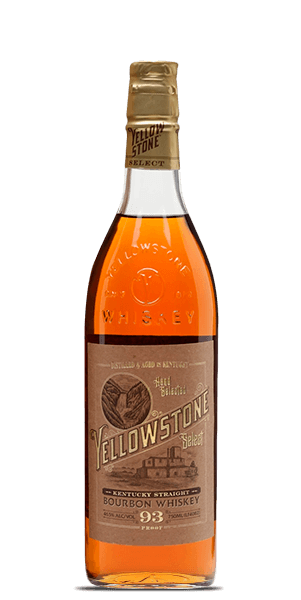 Yellowstone Select Bourbon is a blend of four sourced Kentucky Bourbons — selected for taste and balance — and bottled at a perfect and flavorful 46.5% ABV. In just a few short years it has already won four gold and silver medals. The original Yellowstone Whiskey was distilled in a log-still. It was basically a hallowed-out log filled with copper pipe that was used for primary distillation. What does Yellowstone Select Bourbon taste like? The Flavor Spiral™ shows the most common flavors that you'll taste in Yellowstone Select Bourbon and gives you a chance to have a taste of it before actually tasting it. The aroma has a dash of Rye spice with banana, dried cherry, caramel, herbs, licorice, and brown butter. There’s more rich toffee on the palate with roasted hazelnuts, peanut brittle, flamed orange zest, and toasted sourdough bread. The finish is medium-long and sweet with note of clove. Even with a drop of water, it drinks a little hot in the mouth. Nothing on the bottle proclaims Number of Years Aged - maybe they only age it a year or so. I suppose I could go look it up to find out, but I don't feel like it. I just got bourbon in the mail; thats the level of lazy we're talking about here. It doesn't necessarily have the sweet corn taste you'd expect in a bourbon. I like it, but I'm not going to rush out and buy another bottle. Update 12 days later: Working my way a little deeper into this bottle, I'd like to re-rate this as a solid 8. Really opens up with ice or a splash of water. I tend to drink (and rate) neat. Smooth, with a great finish. good sipping still, very good flavors long lasting finish. Had Yellowstone while on tour at the distillery, left with 3 bottles - it's THAT good. Love it. Just a really good sippin still. Fantastic flavours, it’s one of those products that grows on you with time. Must try especially for those who are from this segment.